One thing guests at the One and Only Ocean Club quickly find out is that they can use all the facilities at Atlantis whereas Atlantis guest cannot use the facilities at the Ocean Club. Considering the small size of the Versailles Pool at this luxurious property, keeping scores of Atlanteans out makes perfect sense. 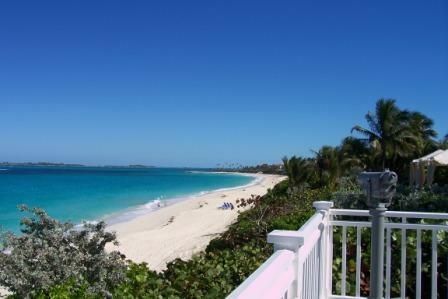 As you can see, the pristine white sand Cabbage Beach is nearly empty at the Ocean Club. The touts selling things usually stay near the public access entrance near the Riu and Atlantis to the west. 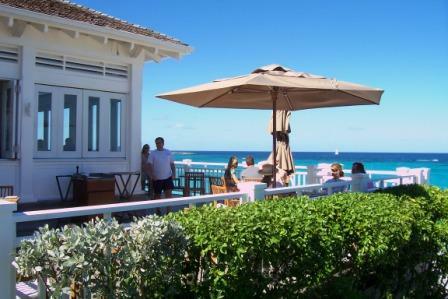 Whether you stay here or elsewhere, don't miss the lovely view from the restaurant Dune. Dinner is a sumptuous affair in the main dining room, but you can eat a delicious breakfast or lunch overlooking the gorgeous turquoise waters. Or simply have a drink at the bar. The experience is well worth your time and money. 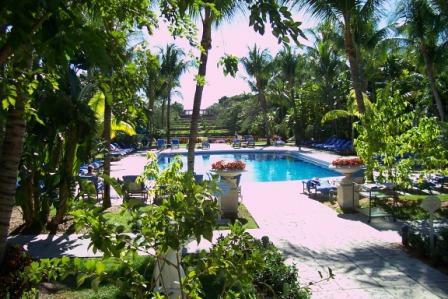 My overall impression of the Ocean Club after many visits is one of peace and luxury in heavenly surroundings. From many Ocean Club guests, I've heard varying stories of inconsistent service. I have never been disappointed there, but I've heard regular complaints of noise, poor service, and the quality of the experience not being worth the very expensive price.